Free Shipping Included! 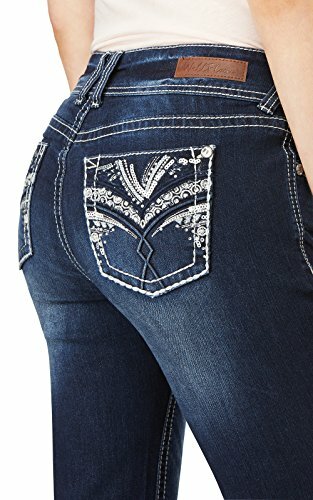 WallFlower Women's Juniors Luscious Curvy Embellished Bootcut Jeans in Kyle, 9 by WallFlower at Felicianeo. MPN: WFM10500B-Z130-9. Hurry! Limited time offer. Offer valid only while supplies last. These Luscious Curvy Bling Bootcut Jeans feature double button closure, embellished pockets and a contoured waistband that hugs your curves. These Luscious Curvy Bling Bootcut Jeans feature double button closure, embellished pockets and a contoured waistband that hugs your curves. WallFlower Jeans is a lifestyle brand that provides stylish looks from head-to-toe at an exceptional value. The brand offers jeans from Classic and Curvy to Plus Size options in a variety of washes. In addition to denim, they offer tops, dresses, outerwear, loungewear, sleepwear and intimate apparel, watches, footwear, handbags and jewelry. Stretch fabric and comfortable fit. If you have any questions about this product by WallFlower, contact us by completing and submitting the form below. If you are looking for a specif part number, please include it with your message.